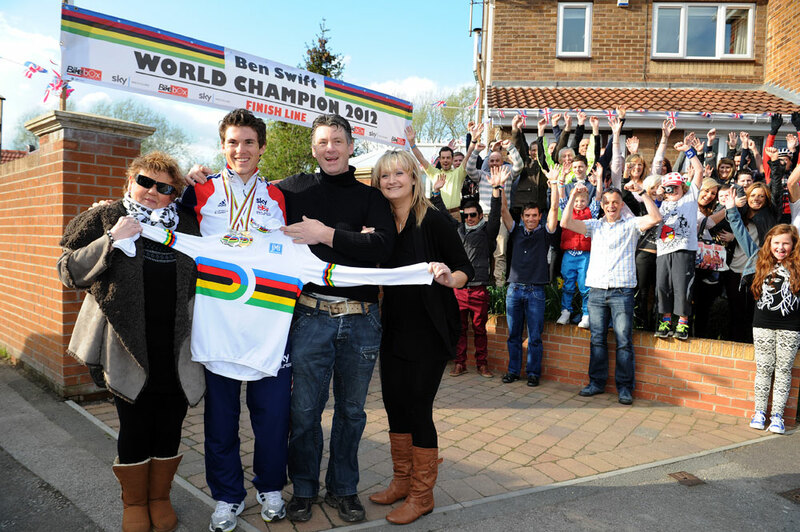 Rotherham’s new scratch race world champion Ben Swift arrived back from Australia on Tuesday afternoon to a surprise home welcoming party organised by his girlfriend Lizi Hamshaw. Swift touched down at Manchester airport just before three o’clock on Tuesday afternoon after travelling back from Australia having taken the scratch title at the Track World Championships at the Hisense Arena in Melbourne last week. The GB and Sky ProCycling rider also took silver in the points race and Madison event later in the championships to bring home a three medal haul. Arriving back in Whiston, Rotherham at just after 5:15pm with girlfriend Lizi, a stunned looking Swift stepped out from the chauffeur driven car to applause and cheers from family, friends and fellow cyclists which included the Downing brothers, Dean and Russell, who had gathered at Lizi’s parents home. 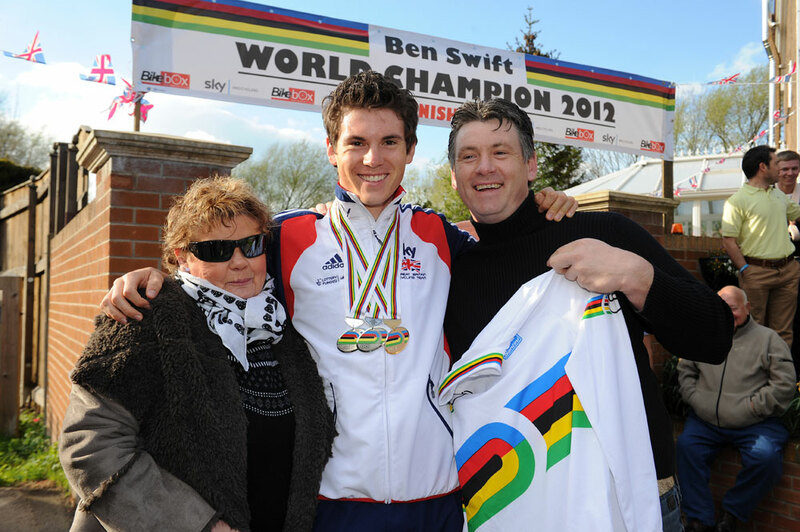 “I think I was the first British rider to win three medals in all the endurance events,” Swift told Cycling Weekly. “It’s all happened so fast really, with the flight and everything. I actually watched the points race back whilst on the flight and saw where I made some of the mistakes. 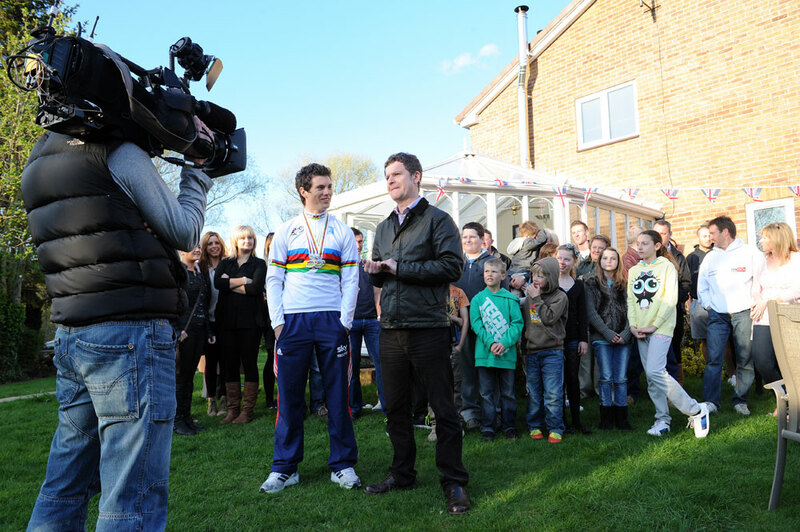 A BBC Look North team were on hand to record the events along with reporters and photographers from the local newspapers. Lizi’s father Alan Hamshaw, owner of BikeBox, had put a welcoming banner over the driveway to the family home to greet the champion home. Their garden made for a temporary BBC studio as Look North reporter Paul Ogden conducted a live feed to the local BBC evening news slot. Ben then returned to the Swift family home to find his sister had adorned the front of the house with welcoming banners too. A tired looking Swift will have a deserved couple of days to recover before getting back in to racing on the road this weekend at the Sheffrec CC race promotion on the Stainton Circuit near Braithwell, Rotherham. 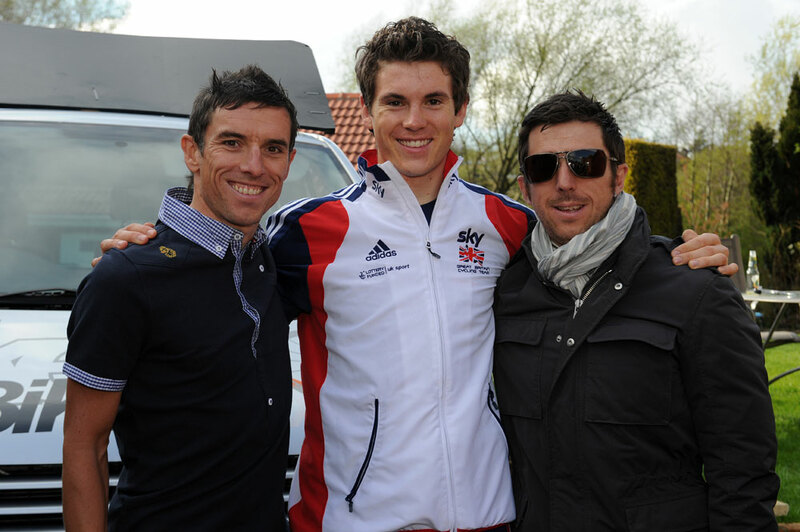 Swift will then be looking towards starting the Giro d’Italia May 5-27 in Herning, Denmark. “Giro d’Italia is coming up on the first weekend of May, so I’ve got about three weeks to get ready for that which is massively different to what I’ve just been doing,” said Swift.